The Triumph family proves the unique versatility of The Royal Kerckhaert Horseshoe Company. The new dropped forged Triumph program, available in both steel and aluminium has proved an instant hit worldwide. The dropped forged process has been adapted by Kerckhaert to maximize the design features seen on the Triumph program today. Kerckhaert have solved the past problems experienced by other shoemaking companies. The Triumph program in steel is so good to work and shape that they are a pleasure to fit, and the improved pitch makes them a dream to nail on. The aluminium Triumph allows the modern sport horse to perform at its maximum, while maintaining the hoof in perfect health. The Triumph program is quickly growing to adapt to the different demands from farriers worldwide, with the introduction of the EU styles. 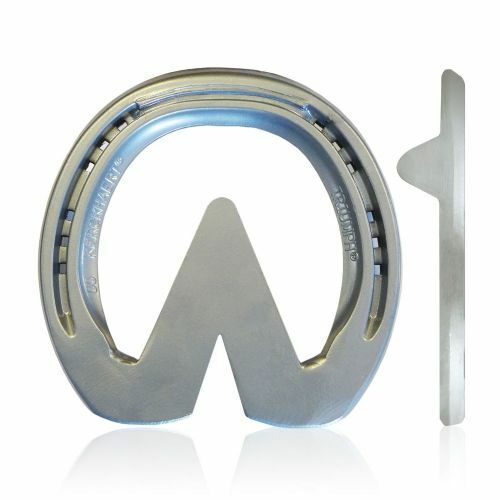 The aluminium Triumph egg bar proves The Royal Kerckhaert Horseshoe Company provides a range of shoes for all styles of shoeing.